Are E-Cigarettes and Juuling Bad for Me? Since e-cigarettes first became available in the early 2000s, they have gained popularity among smokers and nonsmokers alike. Many people choose to use e-cigarettes because they appear to be a safer alternative to smoking tobacco, and makers of these products have advertised them as a means to quit smoking. However, uncertainties remain about the potential health risks of e-cigarettes. Are e-cigarettes safe? Or is vaping bad for your health? Can vaping cause oral cancer? Before choosing to use e-cigarettes, learn the facts about e-cigarettes and how vaping can impact your health. Electronic cigarettes are small handheld devices that simulate the sensation of smoking. These devices contain a cartridge with a liquid solution, a heating element called an atomizer, a battery and a mouthpiece. When the user breathes through the mouthpiece, the liquid solution gets pulled through the atomizer and heated to produce an aerosol, which is often called vapor. The user inhales this vapor through the mouthpiece to create a similar physical sensation as smoking a cigarette. The solution in electronic cigarettes contains nicotine, water, flavorings and a carrier fluid. 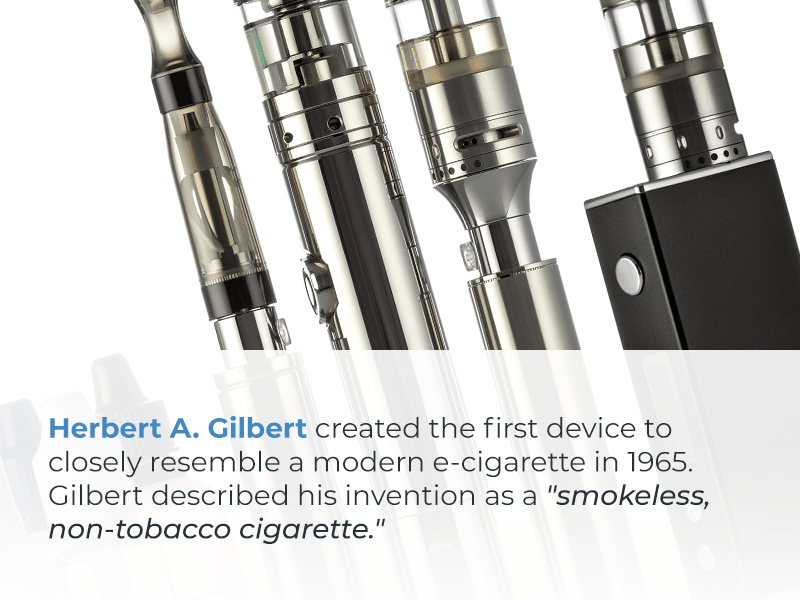 Herbert A. Gilbert created the first device to closely resemble a modern e-cigarette in 1965. Gilbert described his invention as a “smokeless, non-tobacco cigarette.” However, this early model of an e-cigarette never gained popularity. Nearly four decades later in 2003, a pharmacist in China named Hon Lik invented the first commercially successful e-cigarette. Lik’s design resembled a traditional cigarette and used an atomizer to vaporize a liquid solution containing nicotine. Lik developed this e-cigarette after his father, who was a heavy cigarette smoker, died from lung cancer. He intended the device to provide an alternative to tobacco cigarettes and help active smokers quit using tobacco. E-cigarettes reached markets in the United States by 2007 and quickly gained popularity. New e-cigarette companies sprang up, and many big tobacco companies began developing electronic cigarettes. People introduced new models of electronic cigarettes, and made e-juice with tempting flavors like gummy bear, mango and crème brûlée. While e-cigarettes were originally supposed to be a safer alternative to combustible cigarettes, their use has since spread to non-smokers, and many active smokers use e-cigarettes in addition to traditional cigarettes. In recent years, e-cigarette use among teens and young adults has also risen to a troubling degree. Juul is currently the most popular e-cigarette in the United States, and in April 2018, it held 54.6 percent of the market share for e-cigarettes. This number is higher than the top market share for traditional cigarettes, which Marlboro holds at 46.2 percent. Juul only recently entered the market in 2015, but rapidly gained popularity due to its small and discreet design that resembles a USB drive. Juul has since become so widely used that the verb “juuling” is now common slang for vaping with a Juul e-cigarette. Recently, Juul has earned media attention and criticism from anti-tobacco advocates because the e-cigarette brand has become extremely popular among teens and young adults. The prevalent use of these e-cigarettes among teens and young adults has even prompted the Food and Drug Administration to investigate the marketing strategies of Juul and other major e-cigarette companies to verify that they are not targeting youth. According to the Juul company, they intended to create an alternative for those attempting to quit smoking by designing a vape with no buttons and simple design. However, the child-friendly e-juice flavors and Juul’s easy-to-conceal design has made it popular with the wrong audience. Rather than replacing more harmful cigarettes, many young adults who have never smoked before are picking up Juul, raising concerns about future cigarette use and nicotine addiction in teens. 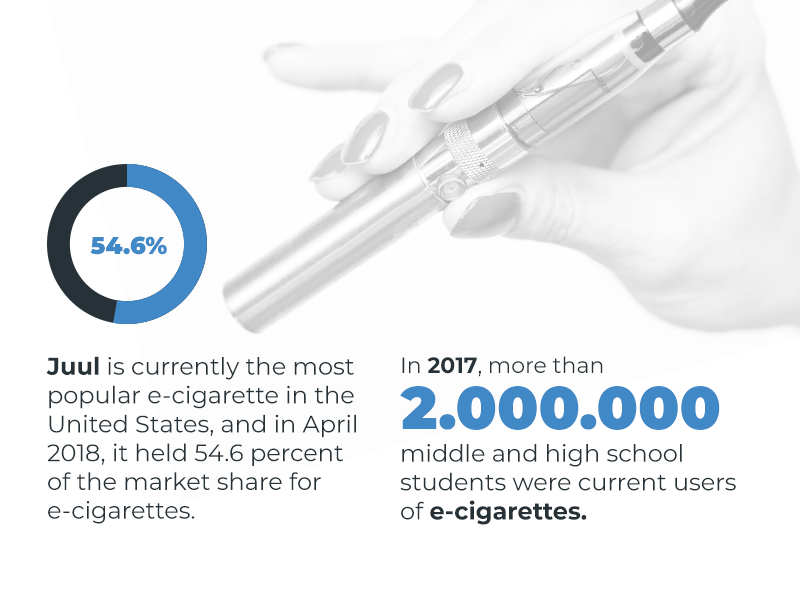 In 2017, more than 2 million middle and high school students were current users of e-cigarettes. A study by the Centers for Disease Control and Prevention showed e-cigarettes were the most commonly used tobacco product among both high school and middle school students in 2016. E-cigarette use has also grown dramatically among both demographics, jumping from 1.5 percent in 2011 to 11.3 percent in 2016 for high school students and 0.6 percent to 4.3 percent for middle school students. While the use of combustible cigarettes among teens has declined in recent years, there is still concern that e-cigarette use may lead to future use of combustible cigarettes. A study by the University of Pittsburgh Schools of the Health Sciences revealed young users of e-cigarettes are more than four times as likely to start smoking cigarettes as their peers who do not vape. Making this issue more troubling, a survey by Truth Initiative revealed 63 percent of young Juul users did not know the product contained addictive and harmful nicotine at all. Vaping is still popular among those trying to quit smoking cigarettes or reduce the number of combustible cigarettes they smoke. For these users, e-cigarettes may be a helpful way to cut back on more harmful cigarettes. However, there is no conclusive evidence vaping is an effective way to quit smoking for good. With e-cigarette use becoming more prevalent, particularly among young users, many consumers are wondering: Is vaping harmful? And, are vapes bad for you? What Does an E-Cigarette Contain? The basic components of vape juice are the carrier fluid, water, added flavorings and nicotine. However, research is underway to help shed light on exactly what chemicals are in e-juice, and how the heating component may alter the liquid solution. The primary health concern for e-cigarettes comes from the nicotine they contain, which poses many of the same health threats as it does in traditional cigarettes. However, another often-overlooked health risk of e-cigarettes is the thousands of tiny particles in the aerosol they produce. The use of the term “vapor” to describe e-cigarette aerosols leads many to mistakenly believe they are only inhaling water vapor, when in reality, they may be breathing in thousands of chemical and toxic particles. These include diethylene glycol, which is also an ingredient in antifreeze, and harmful chemicals contained in the added flavorings. Heating the solution in e-cigarettes may release additional chemicals and toxins into the aerosol, including metals from the joints and coils inside the device. Below are some health risks associated with the common components of e-cigarette solution, as well as other hazardous chemicals that have been found in vape juice. Nicotine: Just like in combustible cigarettes, the nicotine in e-cigarettes is highly addictive and can lead to withdrawal symptoms if a person stops vaping, including headaches, depression and mood instability. Nicotine also poses several other health risks, such as releasing stress hormones like adrenaline that increase blood pressure and constrict arteries. Nicotine can increase insulin resistance and may cause health complications for those with existing heart conditions. Does nicotine cause cancer? Yes, it may also be a carcinogen, as it interferes with the natural death and regeneration of cells in the body. Propylene glycol: The carrier fluid, which makes up the majority of vape juice solution, is usually composed of propylene glycol or vegetable glycerine. Propylene glycol is also in processed foods, cosmetics and some medicines to help them absorb water and is generally safe for consumption. However, exposure to propylene glycol over a long period or in large amounts can cause irritation of the respiratory tract, eyes and skin. Diacetyl and other flavorings: Diacetyl is a chemical in some e-juice flavoring, and chronic exposure to diacetyl links with a respiratory condition called bronchiolitis obliterans, or “popcorn lung.” Bronchiolitis obliterans causes inflammation that obstructs airflow and leads to wheezing and coughing. While diacetyl is primarily in butterscotch-flavored e-juice, a 2015 study by Harvard T.H. Chan School of Public Health found diacetyl in 39 of the 51 flavors they tested, all of which were from leading e-cigarette brands. A study published by the American Heart Association also revealed that many other favorite flavors of e-juice, such as cinnamon and citrus flavors, may damage heart tissue or the heart’s functioning. Metals: The aerosol e-cigarettes produce may contain tiny particles of tin, nickel, chromium and silver that fleck off of the metal coil or solder joints inside the device. Because these particles can be microscopic, they may be able to penetrate lung tissue and cause damage if users inhale them in large enough quantities. Because vaping has only recently gained popularity, the health effects of e-cigarettes remain largely unknown, including whether vaping can cause cancer. However, the primary concern about e-cigarette use is its impact on oral health. When using an e-cigarette, the aerosol comes in contact with the oral cavity when it is at its hottest temperature and is most concentrated. That raises concerns about receding gums, gum disease and other oral health problems. A heavy chronic user of e-cigarettes may even be at risk of developing oral cancer. Researchers need to conduct many more studies to conclusively determine vapor cigarettes side effects, but here are some likely impacts of e-cigarettes on oral health. Receding gums: Nicotine can reduce the amount of blood that can flow through your veins. When blood flow in the gums is insufficient, the gum tissue cannot receive enough oxygen and nutrients to stay healthy, which can lead to the death of gum tissues and receding gums. If tissue death in the mouth continues, more serious diseases can develop. Stomatitis and ulcerations: E-cigarette use has been observed clinically to produce stomatitis, a condition that causes dark-colored spots on the palate and swelling. Medical professionals have also observed ulcerations or burns from the hot chemical aerosol in e-cigarettes. These burns can be very sensitive and painful. Dry cough: Inhaling the aerosol from e-cigarettes can impact the bronchioles of the lungs and produce a dry cough or wheezing. Dry mouth and tooth decay: Is vaping bad for your teeth? Nicotine can prevent the mouth from properly producing saliva, which causes dry mouth. When the mouth lacks saliva, this can also lead to bacteria buildup and tooth decay. Grinding teeth: Nicotine can stimulate the muscles in the mouth and increase teeth grinding in those who already struggle with bruxism. Untreated bruxism can lead to tooth damage and other oral health problems. Gum disease: Nicotine is known to contribute to gum disease, and the nicotine in e-juice is no exception. Nicotine from e-cigarettes has been shown to harm periodontal ligaments around teeth and damage gingival fibroblasts, which are the most abundant cells in periodontal connective tissue. Repeated exposure to e-cigarette aerosol has also been shown to increase the amount of cell death occurring in the mouth with each use. A 2016 study published in Oncotarget also showed e-cigarette flavorings can increase cell damage as a result of the aerosol. Because the health impacts of e-cigarettes remain largely a mystery, users of e-cigarettes should be informed about the signs of gum diseases and oral cancer. Gum disease commonly causes gums to become red, irritated, tender, swollen or to bleed. Some patients with gum disease may have loose teeth or teeth that fall out and may see their gum tissue receding. If gum disease worsens, oral cancer can develop. Knowing the warning signs of gum disease and oral cancer can help you catch these diseases early. However, the best way to protect against gum disease or oral cancer is to avoid using cigarettes and e-cigarettes entirely. While the popularity of e-cigarettes among teens has caused concern, the outlook is not all bad. Between 2015 and 2016, e-cigarette use declined among both middle schoolers and high schoolers. Campaigns, such as FDA’s The Real Cost campaign, have helped educate teens about the dangers of e-cigarettes and prevent teens from vaping. Doctors and parents can also play a valuable role in educating teens and other e-cigarette users about the health risks of vaping. Here are some ways to stay aware of the dangers of e-cigarettes and help raise awareness about the risks of vaping. As a user: Know the health risks associated with e-cigarettes and stay up to date with studies on the effects of vaping. Those using e-cigarettes as an alternative to combustible cigarettes can choose to vape less frequently or purchase e-cigarettes with lower amounts of nicotine. When using e-cigarettes to quit smoking, the final goal should be the cessation of any nicotine consumption. As a dentist: Recognize the effects of e-cigarette use on oral health and inform your patients about these risks. Dentists should know the toxic ingredients e-cigarettes may contain, as well as the benefits vaping may have as an aid to quit smoking. Dentists should offer comprehensive information about e-cigarettes and allow patients to make an educated decision about their e-cigarette use. As a parent: Be aware of the trend of e-cigarette use among teens and educate your children about the risks of e-cigarettes. Be prepared to answer questions your teen may have and provide accurate information about the health impacts of vaping. Parents should also be aware of the signs of gum disease and contact a dentist with any questions about e-cigarette use. Because e-cigarettes and Juuls are still newly popular, there remains much uncertainty about their exact health risks. Many consumers are still wondering: Is vaping bad for your health? 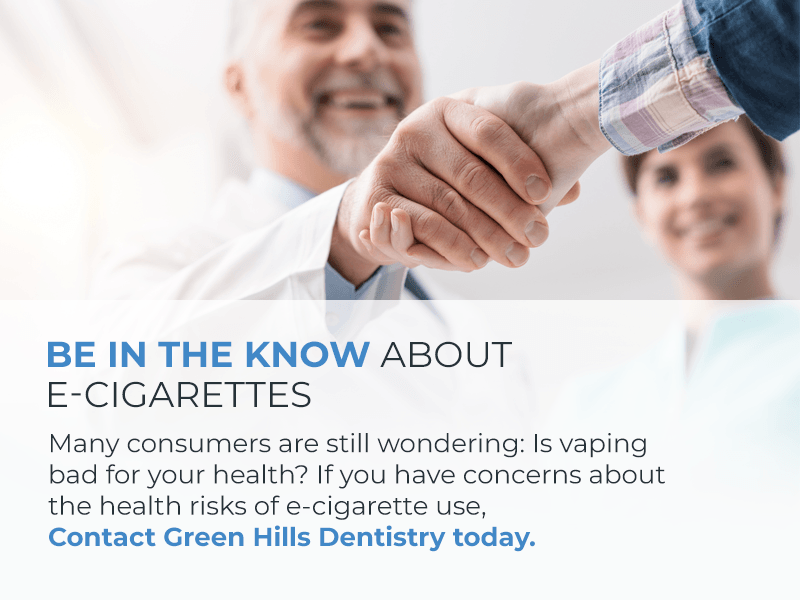 If you have concerns about the health risks of e-cigarette use, contact Green Hills Dentistry today. Our knowledgeable and caring staff will be happy to answer any questions you may have about your oral health. With our extensive training and education, Green Hills Dentistry offers high-quality dental care in a friendly and welcoming environment.